In a blast of blarney, Biden gives Scarborough an ego boost and a possible campaign ad. 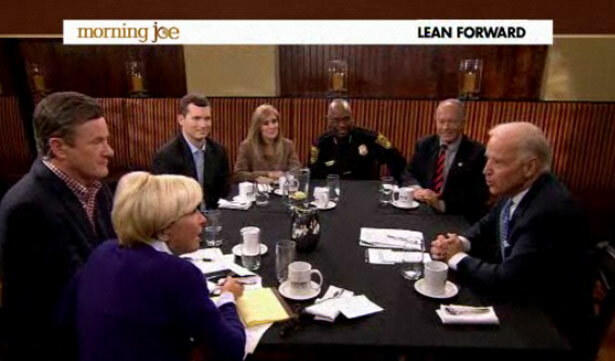 Joe Biden compliments Joe Scarborough on Morning Joe. Consider it a weird preview of an unlikely Joe vs. Joe 2016 presidential race: In a blast of blarney, Joe Biden gave Joe Scarborough an ego boost (and a possible campaign ad) that almost made Joe S’s already swelled head pop off. Biden: Hey, Joe, thank YOU. [Scarborough laughs.] No, no, no, no. You have changed the debate in America. You! Scarborough: Thank you so much. Was Mika thanking the veep on Scarborough’s behalf, like the good helpmeet she so often plays, or was she trying to take some deserved credit for nudging him to evolve? Biden was right to praise Scarborough and Bloomberg. Each has done important work to alter the balance of power on gun control–Scarborough by relentlessly needling his fellow Republicans and the NRA; Bloomberg by funding ads against pols who kowtow to the lobby that protects gun manufacturers from little children. Maybe Biden recognized in Scarborough—whose “moderation” conservatives occasionally attack–an ego in need of a public pat on the back. For Biden, that’s an irresistible invitation to blarney it up. But really, he needn’t bother. Scarborough’s ego has been riding extra high since he debated Paul Krugman last month on Charlie Rose; Scarborough seems to really believe that he “won,” and that most economists agree with him (they don’t) that we can cut our way to prosperity. Would that Joe Biden (and Obama!) praise Krugman as one of the two or three or four Big Names who’ve been fighting to turn Washington’s attention from the non-problem of deficits to the actual catastrophe of unemployment. Now, I could be imagining it, but ever since January, when Scarborough snapped his fingers at Mika to get her to shut up, Morning Joe has had more moments of him snarking and her meeking, him talking over people, her staying quiet but pretty. Lately, co-hosts Barnicle and Willie Geist also seem more cautious if and when they contradict him. I say this as a sometimes fan, but the show is getting hard to watch. I hate all the media masturbation over 2016: Will Hillary run? Will Biden step aside if she does? What’s Hillary’s hair have to say? It’s a great way for the media to avoid today’s problems. And Joe Biden, wilier than he seems, knows how to spread flattery like black ice on a Beltway highway. Leslie Savan on television: The politics of The Walking Dead.